The Nation: Six Unfair Corporate Tax Rules Last year, U.S. corporations paid an effective tax rate of just 12.1 percent, the lowest level in the last forty years. Sarah Anderson and Scott Klinger of The Nation showcase some basic unfairness in the U.S. tax system. 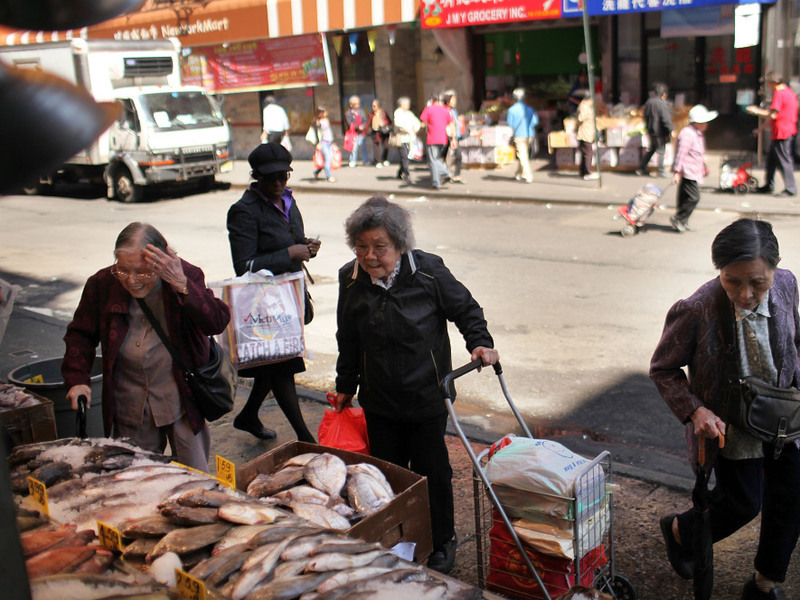 Elderly women walk by a fish market April 19, 2012 in the Chinatown neighborhood of New York City. According to an analysis by the city's Center for Economic Opportunity, the number of New Yorkers classified as poor in 2010 rose by nearly 100,000 from the year before, increasing the poverty rate by 1.3 percentage points to 21 percent. Sarah Anderson directs the Global Economy Project at the Institute for Policy Studies and is a co-author of the report "Taxing the Wall Street Casino. Scott Klinger is an Associate Fellow at Institute for Policy Studies. Many American families will have paid more in federal income taxes than some of America's largest and most profitable corporations. AT&T, Boeing, Citigroup, Duke Energy and Ford collectively reported more than $20 billion of US pre-tax income last year, yet none of them paid a dime in federal income taxes. Instead, they claimed refunds of more than $1.3 billion from the IRS. These corporations are not alone in turning tax dodging into a competitive sport. Last year, US corporations paid an effective tax rate of just 12.1 percent, the lowest level in the last forty years, according to the Congressional Budget Office. Sixty years ago, when Republican President Dwight Eisenhower lived in the White House, corporations paid 32 percent of federal government's tax receipts; last year they paid 9 percent. Below are six examples of how large corporations have rigged the tax rules to ensure that those who have the most get to amass even more, at the expense of everyone else. Figuring out how to unrig them is not rocket science, but it will require strong public pressure on lawmakers to ensure that America's most prosperous corporations pay their fair share. In each of the past nine years, Boeing has reported at least $1 billion in pre-tax profits, yet in only one did it pay any US corporate income taxes. In fact, the aerospace giant got so much money in tax subsidies that it had an effective tax rate of -7.8 percent during this period. One of the main reasons Boeing has avoided the taxman is that the rest of us subsidize their research and development spending. Last year this amounted to $137 million. Congress first passed the research and experimentation tax credit during the 1981 recession, intending to provide a temporary boost to America's sagging economy. Though it has expired for short periods over the years, it has been renewed thirteen times, and Congress is presently considering making the tax credit permanent. Government investment in basic research and development can be valuable, but the way the current tax credit is structured, much of the support goes to large well-resourced high-tech firms like Boeing that would have conducted the research anyway as a part of maintaining a vibrant business. What's particularly disturbing about the Boeing subsidies, however, is that the company already bills the Pentagon for research costs. The third largest defense contractor, Boeing has landed more than $54 billion in government contracts in the past nine years. So essentially, taxpayers are paying for the company's research — twice. General Electric employs 975 people to mine the tax code for every possible deduction. One of their IRS returns ran an awe-inspiring 57,000 pages. As a result, GE paid an effective tax rate of just 2.3 percent on more than $81 billion of US income over the last decade. One of GE's most lucrative tax breaks is dubbed "the active financing exception." Under US tax law income earned from interest anywhere in the world is taxable in the United States. That is because interest is consider a "passive business activity" that is easily transferred from country to country. The active financing exception allows corporation that establish captive foreign finance subsidiaries to exclude interest they earn offshore from their US taxes. The 1997 subsidy was meant as a temporary measure to help US banks and manufacturers compete internationally. General Electric's lobbyists, who led the fight to create the subsidy, have made sure the "temporary" part was just a joke. Congress has renewed the exemption multiple times over the last fifteen years. And in the meantime, active financing has allowed GE to legally shift much of its US profits to overseas jurisdictions with lower taxes. The active financing exception is one of sixty tax breaks, known as "tax extenders," that expired last year. Congress is actively considering reauthorizing them, even while they also consider dramatic cuts to social programs. In 2008, American International Group's reckless uncovered bets helped lead the global economy to the brink of collapse. Taxpayers bailed out the rogue insurer to the tune of $182 billion. Less well-known is a perk the US Treasury made available to AIG that allowed the company to retain its losses to offset against future profits. Tapping these tax losses allowed AIG to report more than $17 billion in tax-free profits in 2011, a move Elizabeth Warren, who chaired the TARP oversight panel, labeled a "stealth bailout." "When the government bailed out AIG, it should not have allowed the failed insurance giant to duck taxes for years to come," wrote Warren in a statement co-signed by three other panel members. "This corporate tax break transfers public money to AIG's private shareholders and inflates executive pay at AIG — both at the public's expense," added Damon Silvers, another member of the oversight panel. At least four of the executives who stand to benefit financially from the tax break were leading the company at the time of the massive failure.